Hello Linux Geeksters. As you may know, Xombrero is an open-source, lightweight, minimalist, web browser, developed in GTK+3 and based on the Webkit engine. It has been designed for the users that prefer command-line interface over the GUI and has a command mode similar to the one in VIm, for tab switching, entering URLs, following links and navigate through the browser history. 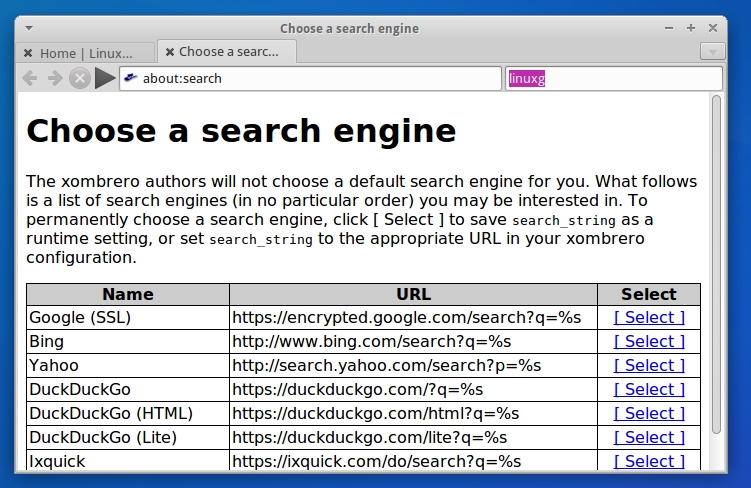 Also, the users can choose the browser’s default search engine. The latest version available is Xombrero 1.6.4, which has been released a while ago. In this article I will show you how to install Xombrero 1.6.4 on Ubuntu 15.04 Vivid Vervet, Ubuntu 14.10 Utopic Unicorn, Ubuntu 14.04 Trusty Tahr, Ubuntu 12.04 Precise Pangolin, Linux Mint 17.1 Rebecca, Linux Mint 17 Qiana, Linux Mint 13 Maya, Elementary OS 0.3 Freya, Elementary OS 0.2 Luna, Deepin 2014, Peppermint Five, LXLE 14.04, Linux Lite 2, Arch Linux, Manjaro, Antergos and other Ubuntu, Arch Linux and derivative systems.